April 19, 2012 - Lt. Col. James Routt, a pilot deployed with the 71st Expeditionary Rescue Squadron, flew the last combat air mission of his 33-year military career over the skies of Afghanistan, April 12. During his career, Routt has witnessed several operations from Vietnam to Operation Enduring Freedom (OEF) in Afghanistan the history Routt has been part of could fill half of a high school student's history textbook. After retiring from the Air Force in 1996, Routt was one of about 200 officers selected under the Retired Aviator Recall program to return to active duty. "I was essentially hired by the 550th Special Operations Squadron (at Kirtland Air Force Base, N.M.) to support the MC-130P Hercules and HC-130P/N King training programs," Routt said. "My main function was to train and mentor the younger instructors and bring my level of aviation experience to the school house." Lt. Col. James Routt flies the last combat mission of his career in a HC-130P at Camp Bastion, Afghanistan, April 12, 2012. Routt is currently the oldest active pilot in the Air Force and is augmenting for the 71st Expeditionary Rescue Squadron. Routt is an HC-130P pilot with the 550th Special Operations Squadron. Watching Routt interact among his fellow aircrew members in his squadron at Camp Bastion in southern Afghanistan, has the feeling of constant mentorship ... like a hall of fame baseball player hanging out among young, thirsty major-league players. The average age of his aircrew is about 26 years old -- Routt has 29 years as an aircraft commander alone in the Air Force. Coming from the squadron that trains MC-130Ps and HC-130P/Ns, Routt has worked with most of the pilots in this squadron before, including the squadron commander. "Colonel Routt was the one who gave me my check-ride," said Lt. Col. Todd Barber, the 71st ERS commander. "Having that much experience in our squadron is great. He's able to mentor many Airmen out here." Routt graduated from Oregon State, attended Officer Training School and soon joined the B-52 Stratofortress community in March 1971. His love for flying however, started decades earlier. "I came into the Air Force because I wanted to fly," Routt said. "Ever since I was a little kid, I just wanted to be an Air Force pilot. Little did I know that dream would turn into a career that has lasted this long." Throughout Routt's career, he has seen changes, not only in the Air Force, but in military life as a whole. "When I came back from supporting Operation Linebacker II, we were greeted at the airport with harsh, unfriendly words from people who saw us in uniform," said Routt, who was a mission planner for the B-52 Stratofortress during Operation Linebacker II. "It's amazing how much things have changed. Nowadays, people will offer to buy me coffee and ask to shake my hand, just because I wear this uniform." Unfriendly verbal jabs from the Vietnam War-era population wasn't the only challenge Routt has faced. "In October 2009, my wife passed away from cancer," said Routt. "We still had a son in high school at the time. After his graduation and the start of his college education, I once again asked if there was an opportunity to deploy with either a (special operations forces) or rescue squadron. The 71st ERS welcomed the opportunity for me to deploy with them in February 2012." Among Routt's accomplishments, one honor specifically sticks out to him, when reflecting on his career. 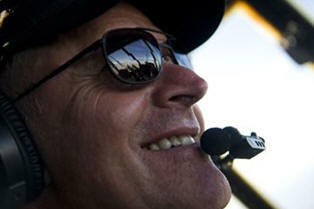 "I received the Master Air Pilot Certificate from the Guild of Air Pilots and Navigators," he said. He was the first Air Force officer awarded the honor since the guild was formed in 1929. "I was the only the third American to receive the award. The first was Neil Armstrong and the second was (Capt. Chesley Sullenberger)," he said. It's common that when folks get close to graduating school, leaving a job or retiring, they try to coast through their short time left as easily as possible, but Routt is taking a different approach. "Being deployed this late in my career has been something I have wanted to do for years," Routt said, who couldn't deploy earlier to Iraq or Afghanistan because of his wife's medical condition. "Our young Airmen today are making sacrifices that a majority of Americans will never experience. I wanted to experience what I have trained hundreds of pilots to do. This truly has been a rewarding experience for me," Routt said. Upon retirement, Routt plans to retire in his home of Washington state.